In my last post, I talked about how I believe we have gotten as much mileage out of the current system as we can get. There’s no juice left in the orange, and squeezing it further will just extract bitterness from the rind. I suggested that instead of relentlessly pounding on our teachers and students to “just get better, already!” what we need is a reboot. We need to rethink what we mean by achievement, by learning, and that it is not something that can be accomplished by layering on new practices on top of the old system. 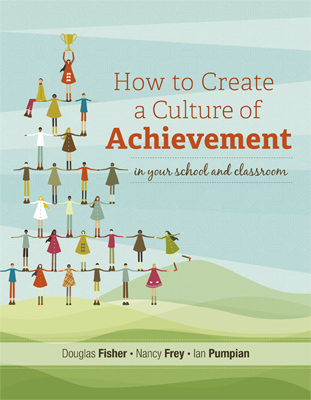 Then along came a new book from ASCD*: How to Create a Culture of Achievement in your School and Classroom, by Douglas Fisher, Nancy Frey, and Ian Pumpian. In it, they authors describe not the best practices of eking out higher test scores and edging the “cusp kids” over the threshhold of proficiency, but the deeper work of building a growth and learning culture. The authors begin with the recognition that in any school system, there must be shared understanding among the staff members. Building that shared understanding and shared vision is the foundation for the principles they have developed in their own work in schools. Each of these chapters explores a way of thinking and being that sets a tone for all learners in a school. The authors have a very relationship‐​centered approach, and they endorse the idea that increasing achievement is not primarily a matter of technical proficiency, but first of managing and nurturing your human resources. They rightly name these as pillars: they are the supporting structures that permit the techniques and methods to have maximum effect. A strength of the book is that the authors show clearly how culture can be designed and implemented with intention; it is not something that just “happens.” Each chapter begins with examples and a description of the pillar, exploring supporting research and related principles that make it work. The authors then present what they call “Service Cycles”: concrete routines and practices that the staff can put into place to begin constructing these pillars. In a way, the service cycles are ways to scaffold the pillars while the staff members begin to learn them and while they are becoming more integrated into the way the school does business. In the first pillar, for example, the authors talk about proactively designing specific routines for welcoming visitors into your school. Step‐​by‐​step processes are put into place to ensure that every guest in the building is treated with respect for their time and purpose, and that the experience is consistent and positive. In the chapter, “It’s Never Too Late to Learn,” one of the service cycles gives guidance about how to build Academic Recovery procedures for assisting struggling students. Each chapter concludes with a short section on Action Research. The authors give specific tools and templates which can guide implementation and monitoring of the service cycles. They discuss how to collect and use data (which they define very broadly) and use it to guide progress. If there is a weakness here, it is in the tendency of practitioners to take a book like this and ignore the admonition from the book’s conclusion, “Building the culture of a school takes time and effort.” Humans like shortcuts, and because the authors have given so many frankly useful tools, forms, and checklists, I suspect there will be school principals who attempt to install them in a building without taking the time to do the real work: to have the conversations and debates, to understand the concepts deeply and thoroughly. If a school leader–or better yet, a school staff–takes this book and uses it as a catalyst to create dialogue around what the school culture is and what it can be, then I believe it could have a profound impact on the real learning that takes place every day. *Full disclosure: ASCD sent me a complimentary copy of this book in order to review it.